Join us for the best physics you'll find this year! We thank all the participants (more than 220 from 29 countries), the speakers, and the poster presenters for making CEWQO 2017 a truly exciting event. Check all the #CEWQO2017 tagged tweets for a look back at the conference as it happened. A special thanks to Frédéric Grosshans (@fgrosshans) and Jasminder Sidhu (@sidhu_jasminder) for live-tweeting! 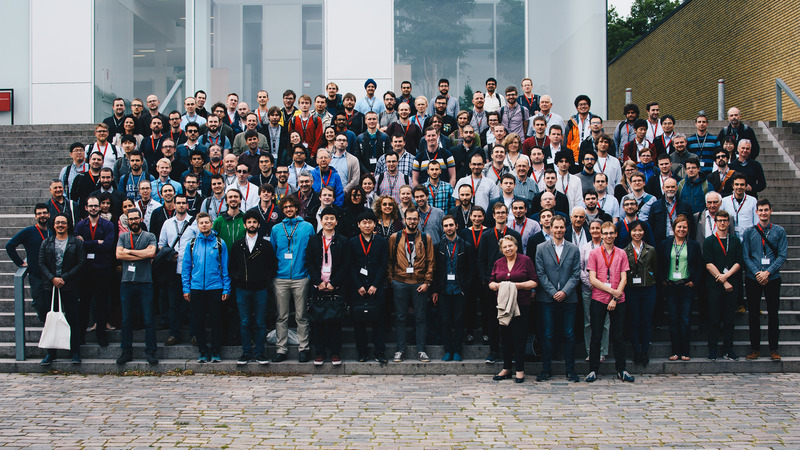 See all the official conference photos at the Flickr gallery of Casper Breum. We have cleaned the site to highlight the information you need during the conference. The pre-conference website has been archived here. Look below for the program, book of abstracts, info on the venue and transportation, and practical info and events. Be sure to check our Twitter feed for any updates and announcements. If you don't find the information you need here, get in touch with one of us in person or shoot us a tweet. The emergency number in Denmark is 112. Defibrillators can be found in the neighbouring buildings 301 and 306. Smoking is not allowed inside all buildings at DTU. For WiFi you can use the eduroam network or the personal login handed out at the registration. The wardrobe is on your own responsibility. Please don't leave any personal items lying around since this is a public institution with open access. You can get in touch with the industry exhibitors all Tuesday and Wednesday. Lunch will be served every day in the DTU canteen in the main building 101. The canteen is within 5 min walking distance from the conference venue. For advice on public transportation to and from the conference venue, see the Getting there section below. There are clear indications that there is increased interest from both commercial and governmental entities in investing heavily in research and development activities that will bring the technologies of the second quantum revolution into a commercial context. While many of these technologies have the potential to be paradigm-shattering, there are still many technological and commercial challenges to be addressed, some of which are unique to Quantum Technologies. The industry session on Tuesday afternoon includes a panel discussion on the subject "Is now the time to tunnel to market?" The context for the discussion will be provided by the 3 speakers, each with their own unique and first hand, hands-on experience of these challenges. You can hang your poster on Monday and leave it up for the duration of the conference (although, please take it down at latest during the lunch break on Friday). You are expected to be near your poster during its designated slot but can spend the remaining two hours on visiting other posters. The two best posters will be awarded a prize. These will be chosen by a vote among all conference participants. During the poster session, beverages and traditional hotdogs will be served outside in the courtyard from authentic cars (in Danish: pølsevogn). Food and drinks are ad libitum. Some of the posters will be introduced in 30 second speed talks on Monday and Tuesday. All poster presenters have been given the chance to promote their poster this way. The order of speed talk presentations is by poster ID, which in turn is ordered alphabetically by the presenter's last name. We ask all presenters during one speed talk session to stand ready next to the stage. A group photo will be taken on Thursday before lunch on the wide stairs at the end of the square outside the west exit from building 303. On Wednesday, a boat trip with guide through the Copenhagen channels is planned. At the end of the tour you will be dropped off near Nyhavn from where you are free to explore Copenhagen on your own. The conference dinner will be served in Meyers Spisehus on Thursday evening, beginning at 19:00. Meyers Spisehus is located in the center of Lyngby. 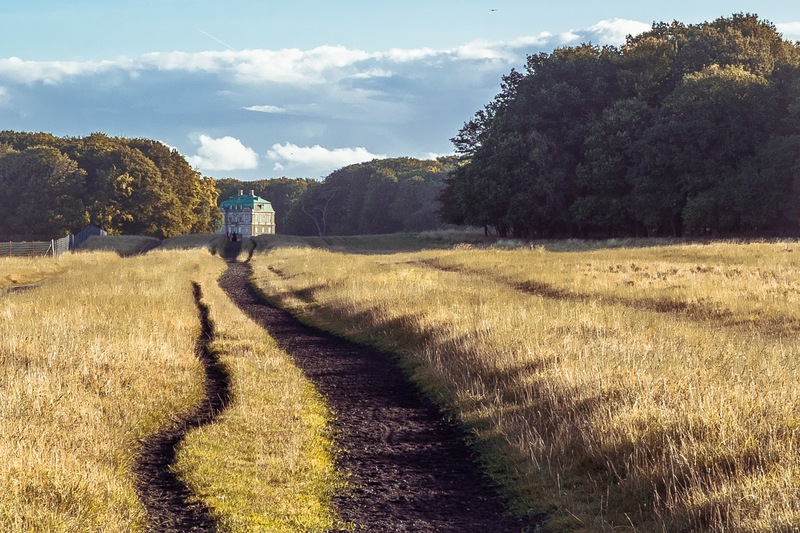 From DTU it takes about 30 min to walk there, or you may take a bus towards Lyngby, getting off at Lyngby Storcenter or Lyngby Station. Click the speaker names in the schedule below to see their talk titles and short summaries. We present for the first time an analytic formula for the entanglement of formation (EoF) of general bipartite Gaussian states. We show through physical examples that EoF is a superior measure of entanglement than Negativity. We also discuss an unexpected decoherence effect when detecting the radiation from accelerated quantum sources. Electronic spins yield excellent quantum sensors, offering quantitative, nanoscale sensing down to single spin levels. I will present our recent achievements in employing electronic spins for nanoscale magnetometry of solid-state systems. I will focus on quantitative quantum sensing of antiferromagnets and superconductors and how it competes with state-of-the-art magnetic imaging. We use a fully tunable microcavity to demonstrate the control of spontaneous emission from nitrogen-vacancy and silicon-vacancy centers in diamond. This allows us to realize efficient and narrow-band single photon sources under ambient conditions. We bound the ultimate rates for distributing secret keys via quantum repeaters, from the basic scenario of a single repeater chain to an arbitrarily-complex quantum network, where systems may be routed through single or multiple paths. 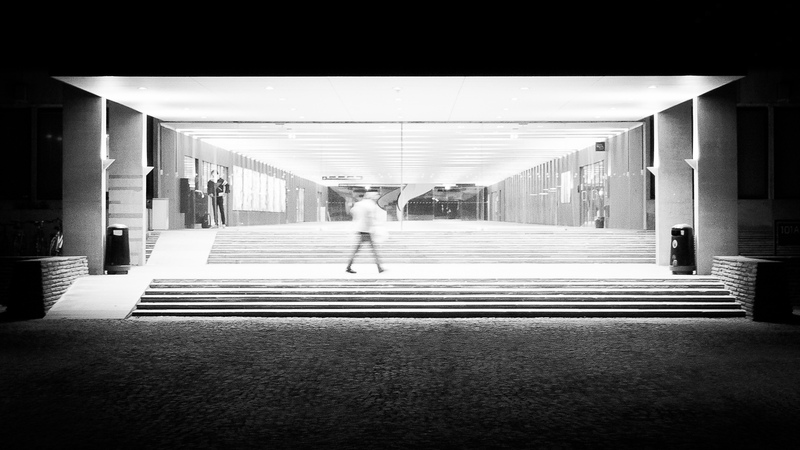 We establish the end-to-end capacities under fundamental noise models, including optical loss. We simultaneously squeeze two non component of the angular momentum of an atomic ensemble. We show how to reduce the quantum mechanical back action below δF~N^1/2, the classical limit for N spins. Performing simultaneous non-commuting measurements on a single quantum system is impossible because of the disturbances generated by the measurements. However, if one possesses two copies of the system, this problem can be overcome. We perform simultaneous non-commuting measurements and fully determine the state of the system using quantum clones. A proper expression of the uncertainty relation relies on entropy power. The resulting entropy-power uncertainty relation is equivalent to the entropic formulation of the uncertainty relation, but can be further extended to rotated variables. Hence, we prove a tighter form of the entropy-power uncertainty relation taking correlations into account. Novel sensing techniques are at the heart of a wide variety of modern technologies. Nanomedicine, molecular biology, chemistry and material science require the ability to measure properties of matter at the atomic scale. Here we show that diamond spin sensors can provide new tool for sensing at nanoscale. We also show how quantum error correction protocols allows to improve performance of diamond spin magnetometers. We show that appropriate preparation and detection of the modal structure of photons used in quantum-enhanced interferometry can alleviate deleterious effects caused by other, experimentally inaccessible, degrees of freedom. We present an experiment in which spatial mode engineering restores sub-shot noise precision of two-photon interference degraded by residual spectral distinguishability. We develop a non-Markovian theory describing the role of phonons on the indistinguishability and efficiency of semiconductor single photon sources. In this work we present the experimental demonstration of a three-photon energy-time entanglement realized via cascaded down-conversion in nonlinear crystals. The entanglement was analyzed with three imbalanced Franson interferometers, resulting in a visibility of the three-fold coincidences of (92.7 +/- 4.6)%, with negligible two-photon and single-photon visibility. We have developed a quantum optical magnetometer which is capable of detecting tiny bio-magnetic fields. In proof-of-principle experiments on isolated animal nerves and hearts, we demonstrate that we can detect nerve impulses and the heartbeat. Possible applications include non-invasive diagnostics of diseases related to the brain, heart and nervous system. We will present recent theoretical and experimental achievements in a direct diagnostics of nonclassical and quantum non-Gaussian states of many photons and phonons. We will report on a detection of non-classical light already from many hundreds of single-photon emitters and quantum non-Gaussian light from nine emitters and its application. Quantum key distribution has the unique advantage of allowing secure communications with long term secrecy. Here I discuss recent work to realise practical and reliable systems that operate with high key rates on data carrying, installed fibres, as well as next generation quantum networks based on entanglement. The Internet is among the most significant inventions of the 20th Century. We are now poised for the development of a quantum internet to exchange quantum information and distribute entanglement among quantum memories (and ultimately quantum computers) that could be great distances apart. This kind of quantum internet would have a range of applications that aren't possible in a classical world, including long-distance unconditionally-secure communication, certain types of precision sensing and navigation, and distributed quantum computing. But we still need to develop or perfect many types of components and protocols to build such a quantum internet. This talk will consider some of these components, focusing on photonic integrated circuits, diamond spin-based quantum memories, and prototype networks. Specifically, the first part of this talk will review our recent progress in adapting one of the leading PIC architectures—silicon photonics—for different types of quantum secure communications protocols. The second part of the talk will consider how photonic integrated circuits technology may extend the reach of quantum communications through all-optical and memory-based quantum repeaters, as well as extensions to modular quantum computers. We introduce a new optical nanofibre-based biosensor that, for the first time, reaches the quantum noise limit. We achieve state-of-the-art sensitivity, tracking single 3.5 nm unlabelled biomolecules with a four order-of-magnitude reduction in optical intensity. This provides a pathway to explore the machinery of life without labels or photochemical damage. We present the basic principle how quantum advantages of communication can be realized using todays technology. The main focus of the presentation will be on optical quantum fingerprinting, but we will also include more recent results. We prove the longstanding conjecture stating that Gaussian input states minimize the output entropy of one-mode quantum Gaussian channels for fixed input entropy. Our result is crucial to prove the converse theorems for both the triple trade-off region and the capacity region for broadcast communication of the noiseless Gaussian amplifier. We present a composable, finite-size security proof, valid against arbitrary attacks, for high dimensional time-frequency quantum key distribution. Combining advances in entropic uncertainty relations with decoy state analysis, our proof predicts key rates of Mbits/s over metropolitan distances (40 km) and maximum transmission distances of up to 140 km. The Bernoulli factory is an algorithm which takes a sequence of Bernoulli random variables (or coin flips) and outputs a new function. We report an experiment using linear optics which demonstrates a clear quantum advantage in resource consumption when coins exist in superpositions and exhibit non-classical correlations. This talk will present an overview of our latest progress towards realizing extended quantum networks, including the first loophole-free violation of Bell’s inequalities and the first primitive network experiments on a pair of spatially separated two-qubit nodes. Mechanical oscillators coupled to light via the radiation pressure force have attracted significant attention over the past years for allowing tests of quantum physics with massive objects and for their potential use in quantum information processing. Recently demonstrated quantum experiments include entanglement and squeezing of both the mechanical and the optical mode. So far these quantum experiments have almost exclusively operated in a regime where the light field oscillates at microwave frequencies. Here we would like to discuss recent experiments where we demonstrate non-classical mechanical states by coupling a mechanical oscillator to single optical photons. These results are a promising route towards using mechanical systems as quantum memories, for quantum communication purposes and as light-matter quantum interfaces. Appropriate combinations of elementary quantum operations can faithfully emulate the effect of a strong Kerr nonlinearity on weak states of light. We experimentally demonstrate a nonlinear phase shift at the single-photon level by using coherent states as probes and full quantum tomography of the output states. A future quantum internet connects small quantum processors by long distance quantum communication. Possibly the most well known application of quantum communication is quantum key distribution, but many other interesting applications already exist. Here, we propose stages towards the development of a full blown quantum internet, where each stage is distinguished by the successively larger type of applications that it supports. We continue by presenting a test to assess the performance of quantum repeaters for transmitting qubits, rather than key bits, which is required by many protocols. Quantum-dense metrology (QDM) enables simultaneous sensing of two orthogonal phase space projections of a signal by using continuous-variable two-mode entanglement. We show how this approach can be used to achieve sub-shot noise sensitivity even in the presence of classical disturbances, i.e. when the measurement was not even shot-noise limited. Correlation plenoptic imaging pushes imaging to its fundamental limits of both resolution and depth of field, thus enabling diffraction limited imaging with an higly improved DOF. We demonstrate CPI with both chaotic light and entangled photon sources. Both theoretical and experimental results are presented. We realized a quantum enhanced wide field microscope exploiting spatially multimode photon number correlations. It provides true (without postselection) sub-shot noise sensitivity for each one of the 10^4 pixels of the image. Absorption sensitivity approaching the best (known) strategy is also reported and discussed. We are working on hybrid quantum information processing, which combines two methodologies of quantum information processing – qubit and continuous variable (CV). More precisely, we encode logical qubits by using CV methodology and utilize CV quantum processors for the realization of a fault-tolerant large-scale universal optical quantum computer. I present a work addressed to demonstrate quantum enhanced resolution in confocal fluorescence microscopy, achieved by exploiting non-classical photon statistics of fluorescence emission of single nitrogen-vacancy color centers in diamond. Ongoing applications in biology will be presented. I will describe our recent results based on atomic arrays trapped near a nanofiber: the demonstration of optical memory in this all-fibered setting, the heralding of a single collective excitation and its subsequent conversion in a single photon, and the observation of a large Bragg reflection for the guided light. Strong interaction between two single photons is of broad fundamental interest and would enable several new tools in the field of quantum information. It requires two main ingredients: a strong non-linear medium and a source of single photons compatible with the medium. We show the combination of two such systems. We report on experimental implementation of linear-optical quantum Fredkin gate and its utilization for several important tasks such as quantum cloning, purification of single qubits or measurement of purity of quantum states. Our setup combines single- and two-photon interference and encoding of information into polarization and path degrees of freedom. We discuss the recent advances in the field of quantum simulation, searching for optimal algorithms for the modern setups with limited resources. We show that Floquet engineering of the Hamiltonian can be used to simulate efficiently various spin models using microwave quantum optical systems, and study symmetry protected topological phases. I will first discuss our efforts to deterministically generate single photons by using planar dielectric antennas. In the second part I will present experiments where photons and single molecules strongly interact. A single molecule can amplify a weak laser beam and generate nonlinear effects like three-photon amplification and four-wave mixing. We present a new quantum memory protocol for coherent light storage based on off-resonant cascaded absorption (ORCA) in warm atomic vapour. The ORCA memory is broadband and noise free, and we demonstrate the storage of GHz-bandwidth heralded single photons without any degradation in the measured anti-bunching of g(2) = 0.02. We experimentally implement a heralded procedure for increasing the amplitude of optical Schrödinger’s cat states (coherent superpositions of coherent states) by linear optical transformations and conditional measurements. Our protocol can be applied iteratively allowing creation of Schrödinger’s cat states of arbitrarily high amplitudes. We are currently developing a versatile experimental photonic platform for simulating complex quantum networks. The platform consists of intrinsically multimode systems based on parametric processes pumped by optical frequency combs. We show how the classical asymptotic scaling of the estimation error can be surpassed using initially entangled states, if a general and realistic kind of noise is considered. The ultimate precision is determined by the short-time behavior, which when departing from a memoryless (LIndbladian) regime leads to super-classical asymptotic resolution. We establish the fundamental limit of communication capacity within Gaussian schemes under phase-insensitive Gaussian channels, employing multimode Gaussian states and collective Gaussian operations and measurement. We prove that this Gaussian capacity is additive so that a single-mode communication suffices to achieve the largest capacity under Gaussian schemes. A measurement of motion not limited by the standard quantum limit has been recently demonstrated. We report the results of the experiment where motion of a nanomembrane is measured in the reference frame of the atomic spin and outline a proposal for using it for accelerometry and gravitational wave interferometry. Synchronization, a universal phenomenon in a broad spectrum of complex systems, has been recently explored in the quantum regime also in relation to quantum correlations. After reviewing the role of dissipative couplings on synchronization, optomechanical devices and an application of synchronization for quantum probing will be presented. Continuous position of force measurements of massive systems are subject to measurement back-action resulting in the standard quantum limit of measurement sensitivity. Current experiments with optomechanical systems reached the regime where measurement sensitivity is limited by back-action-noise. I will discuss an approach towards surpassing the standard quantum limit by coherent cancellation of back noise using an auxiliary system exhibiting an effective negative mass. The auxiliary system is a spin polarized atomic ensemble. This method of back action cancellation was recently demonstrated in the lab of Eugene Polzik (Copenhagen). We describe recent results in quantum cryptography, focusing on practical photonic implementations, using encodings in discrete or continuous variables of light, of central quantum network protocols, enabling secret key distribution, verification of entangled resources and transactions with quantum money, with maximal security guarantees. We consider adaptive metrology and draw a novel connection with teleportation. For teleportation-covariant channels we find that adaptive estimation cannot beat the standard quantum limit, with the quantum Fisher information determined by the Choi-Jamiolkowski matrix. As an example, we establish the ultimate precision for estimating excess noise for quantum cryptography. We introduce a new, physically motivated approach to semi device independence in prepare-and-measure scenarios, based on bounding observables such as mean energy. This has applications to secure information processing, e.g. randomness generation and cryptography. We also review two recent experiments demonstrating semi-device-independent quantum randomness generation. In this talk, I will discuss characterizations and quantifications of macroscopic quantum superpositions in various aspects. I will also talk about how such states can be utilized in the context of optical quantum information processing to overcome limitations of the well-known approach based on single-photon qubits. Interfacing optomechanical systems with non-classical light offers a way to control and steer the quantum state of mechanics. We present experimental and theoretical progress in this direction, including demonstration of quantum-enhanced feedback cooling of a mechanical oscillator and a proposal for generation of macroscopic superposition states using non-Gaussian optical states. There is a discrepancy between the criteria from quantum information science and quantum optics for determining the quantumness of correlations. Here we present a protocol which uses quantum correlations as defined within quantum optics framework as a resource to perform a nonlocal task more efficiently than any classical algorithm. We demonstrate for the first time the computational hardness of a sub-universal quantum computational model based on Continuous-Variable input states and homodyne detection. This new model is inspired by Discrete-Variable “Instantaneous Quantum Computing”, and is a sensible candidate for the practical demonstration of quantum supremacy. QKD is in practice limited to a few hundred kilometres, but can be extended to longer distances by use of a quantum repeater. In this talk, we discuss the possibility of a quantum key repeater, which would work beyond the limits of entanglement distillation and hence conventional quantum repeaters. Artificial gauge fields promise a route to controlling topological properties of photonic systems but have only been realized by static design. In this presentation, we report that perpendicular electric and magnetic fields can effect dynamically controlled artificial gauge potentials for exciton polaritons. We present hybrid quantum integrated circuits combining on-demand III-V nanowire quantum emitters and CMOS compatibility. Using our approach, we demonstrate on-chip generation, spectral filtering, routing, and wavelength division multiplexing of single-photons, all electrically-tunable. The selected nanowire quantum dots are deterministically integrated in silicon nitride waveguides using a novel nanomanipulation-technique. 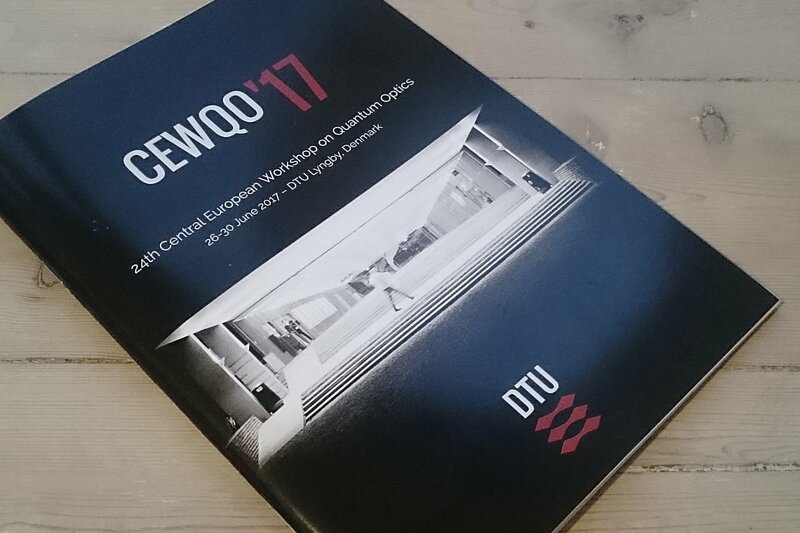 Keep track of news about CEWQO 2017 by following us on Twitter. CEWQO started in the 90s as a series of workshops in Central Europe, initiated by József Janszky in Budapest. Since then, it has grown in scope and geographical reach to become a full-fledged international conference covering all major topics in modern quantum optics research. 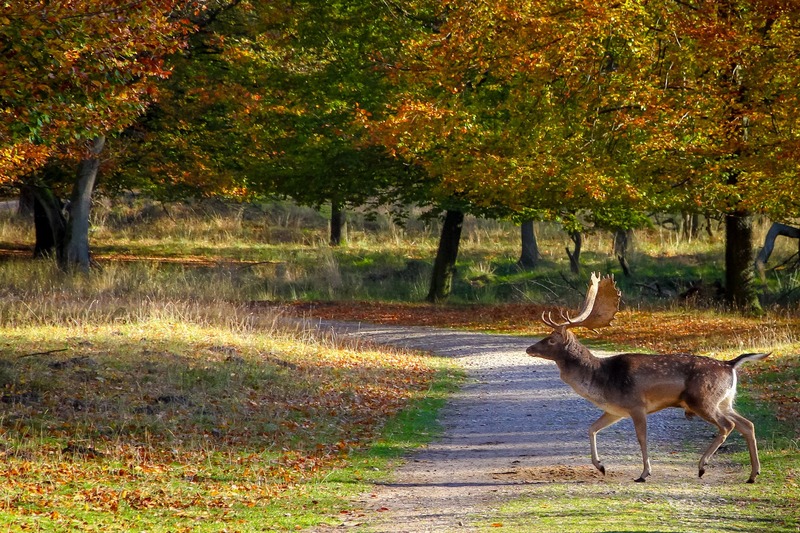 DTU is located just 30 minutes north of Copenhagen, the popular capital with lots to see and do, easily covered by foot or bike. The local area offers forest, lakes, sea, and idyllic towns. Further afield are top-class attractions such as Kronborg and Frederiksborg Castles and the Louisiana museum of modern art. DTU is Denmark's largest technical university with 10,000 students and 1400 PhD students, more than half of which are from abroad. 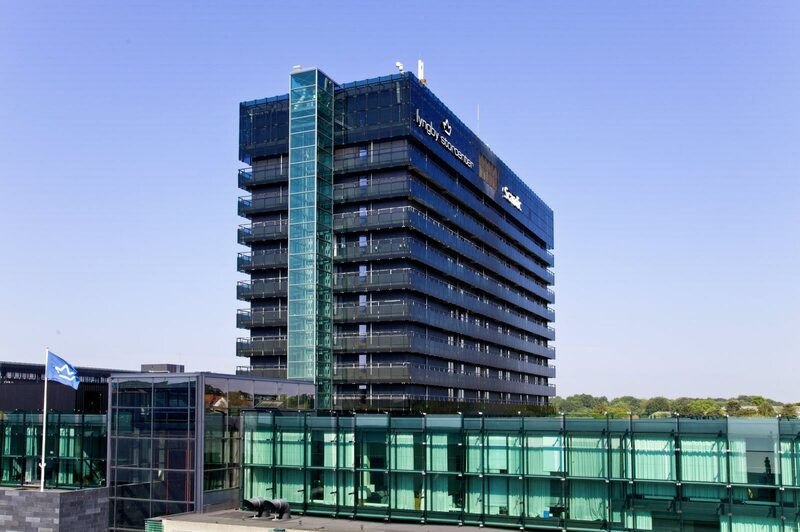 The conference will take place entirely in building 303 at DTU's Lyngby campus. The exception is the daily lunch buffet which will be served in the university's main canteen in building 101. This map shows the relevant areas and access routes on campus. 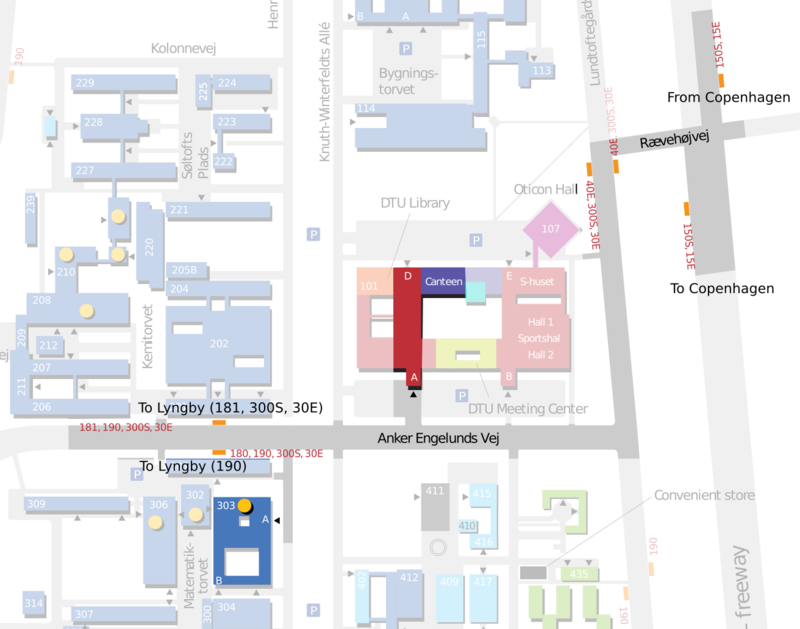 Zoom-in of DTU Lyngby campus with only the places of interest highlighted: bus stops, conference venue B303, canteen. Download a full map of the campus here. Visit copenhagen has gathered an extensive guide to transportation in the area. Journey Planner can find the best routes for you at a given time. Google Maps is a good alternative. Instructions on how to purchase and how to use Rejsekort, the electronic ticket touch card. A brilliant forum thread on TripAdvisor that explains how to use Rejsekort better than any official website. You can buy tickets in vending machines at stations or from the bus driver when entering buses. You purchase a ticket for your entire journey, even if you change e.g. from bus to train along the way. The cost of a single ticket from Copenhagen to DTU is 60 DKK, while if you use the Rejsekort electronic card it is only 32 DKK. Furthermore, using the card means you don't have to worry about buying tickets for every trip - you just need to top up the card in one of the dedicated machines if your card is running low (at least 70 DKK should be left on the card to be able to check in). Any remaining saldo can be paid out in cash at the airport. As a non-resident you should go for the Rejsekort Anonymous version. You can purchase this in the airport and at all S-train and Metro stations in Copenhagen. It costs 80 DKK, but these are quickly earned back on the discount compared to individual tickets. When using the Rejsekort it is important to remember to CHECK IN every time you change mode of transport and to CHECK OUT at the end of your journey. While Rejsekort is the cheapest means of getting around, it is not completely intuitive to use. Do at the very least read the TripAdvisor thread linked above where question and answers contain almost everything you need to know about Rejsekort as a visitor to Copenhagen. 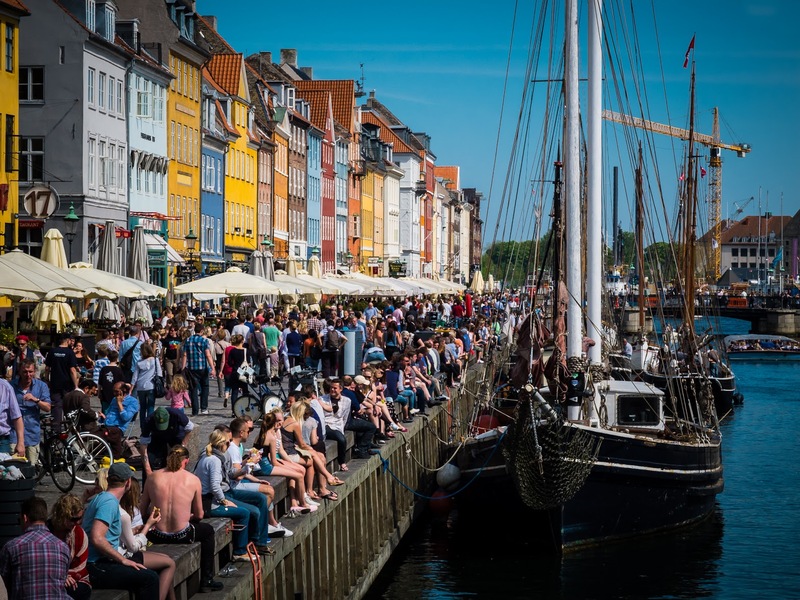 Whether you are going to Copenhagen city centre or directly to DTU, you will take either the train (Öresundstog) towards Copenhagen/Helsingør or the metro towards Vanløse. Take the train to Lyngby St. from any of the stations in central Copenhagen and switch to bus from there. Alternatively, catch the highway buses 150S or 15E to/from Nørreport St. and get on/off at the "Rævehøjvej (DTU)" stop. From there it's a 10-15 minutes walk to the conference venue. Take bus 180, 190 (parked just on the right when exiting the station's north exit) or 300S (towards Gl. Holte, parked just on the left when exiting) and get off at the stop named "DTU" (sometimes "DTU, Anker Engelunds Vej)". 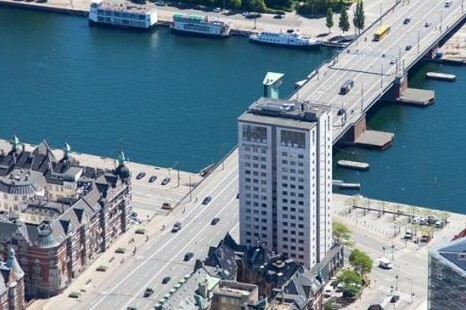 The same buses (except 180, but additionally 30E) also depart from the stop near the Magasin department store, across the street from Scandic Hotel. 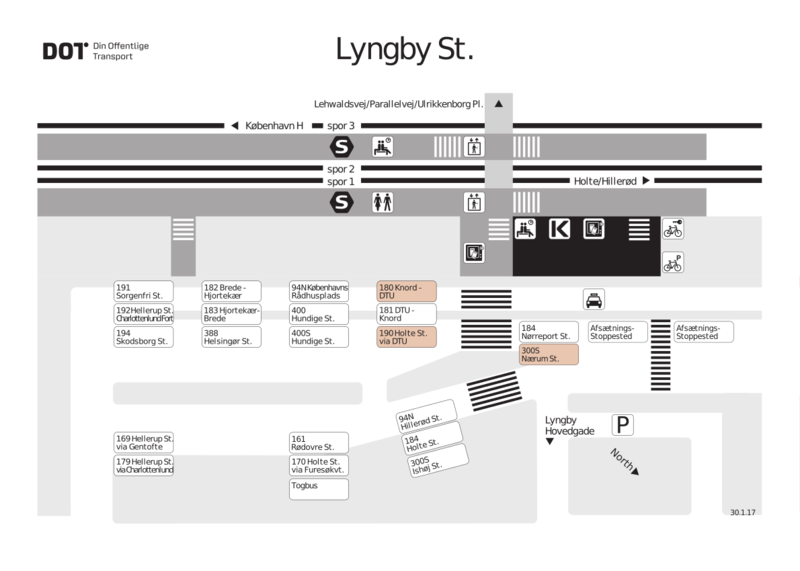 See a map of Lyngby station. Map of Lyngby station. Buses towards DTU are marked in orange. Download here. Take bus 181 or 300S (towards Ishøj St) from the bus stop across the street from the conference venue or bus 190 from the bus stop on the same side as the venue. 30E from the opposite side is also an option, but this line does not stop at Lyngby Station, so you would have to get off at Lyngby Storcenter and walk to the station. See this map for the bus stop locations. There are not a lot of hotels in the vicinity of DTU, but getting from any of the train stations in central Copenhagen to the conference venue takes 35-40 minutes, so it is perfectly feasible (and perhaps more interesting) to stay in Copenhagen. Please note that we do not provide any assistance with booking of hotels or other accommodation. That said, here is a list of suggested hotels with convenient access to public transportation. There is one big hotel in Lyngby, the Scandic Eremitage, 20 minutes walk from the venue. We have secured 30 rooms at a discounted price of 1448 DKK single / 1648 DKK double per night for a flexible booking, incl. breakfast. To take advantage of this offer, please fill out this form and return to the hotel at latest 12 May. The Danhostel Copenhagen City hostel is located in the very center of Copenhagen. Name; phone number; email address; dates of your stay; desired room type. Wakeup Copenhagen (Borgergade) ☆☆ - 10 min from Nørreport St.
Hotel Kong Arthur ☆☆☆☆ & Ibsens Hotel ☆☆☆ - 5 min from Nørreport St.
Hotel Østerport ☆☆☆ - 1 min from Østerport St.
Copenhagen Downtown Hostel ☆☆ - 10 min from Central Station and Nørreport St.
See you at DTU in June! Built on Foundry theme by Medium Rare.